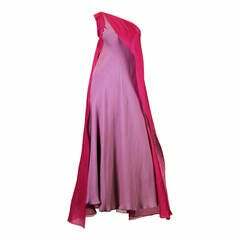 This is a show-stopping Tadashi Shoji evening gown from the early 1980's in a gorgeous draping rose pink/mauve jersey. It has a heavily draped bodice with batwing sleeves and a deep V neck. The drapes attach at the waist and cascade down the front to the floor, skirt ending in a slight train at the back. It has an embellished waist panel with beading and sequins. There is a back zipper closure and slight shoulder pads that add some structure to the heavily pleated shoulders. 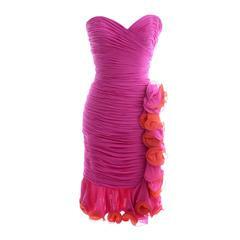 The dress is reminiscent of The Norma Kamali Butterfly dress in the way it is cut. Marked as a size 10, but please use the measurements below to ensure the perfect fit. We estimate this dress to fit more like a US women's size 8/10. BUST: FREE WAIST: 28" HIPS: 42" LENGTH from shoulder to waist: 18" LENGTH: 58"
Wunderschön drapierte und gemusterte Miederdetails sowie rosa Perlenbündel in den Blumenzentren.